“Hey Mom! I said I was going to clean the playroom! Big Sprout is cleaning the playroom so I can’t! You need to stop him!” Middle Sprout yells at me. “Just help him, you can get a bead too!” I remind her. Yes, it is another form of tattling, but one that I have been able to nip in the bud, and to be honest, I love that they are fighting about this. It has been a miraculous few days in our house. Traditionally with our long breaks (we are on a three-week spring break right now) I have struggled with keeping structure and sanity. The kids, although acting the way that kids should, get to be sooooo annoying. Annoying to each other…annoying to my husband….and eventually the whole thing starts to annoy me. I was a high school English teacher, and I really never had a problem with classroom management, but something crazy happens to kids when they are bottled up in their own home with their siblings. I’ve tried sticker charts, I’ve tried elaborate flow charts, I’ve tried a marble jar, I’ve tried privilege charts, I’ve tried dry-erase boards, I’ve tried bribing, I’ve tried yelling and screaming and I’ve even tried silence. All of those strategies have moderately worked, but not anything like these Decision Beads. I cannot take credit for them. It was a craft that my kids did at church, but they have responded so well to the adaptation we’ve made here in our house, that I will definitely keep using them. 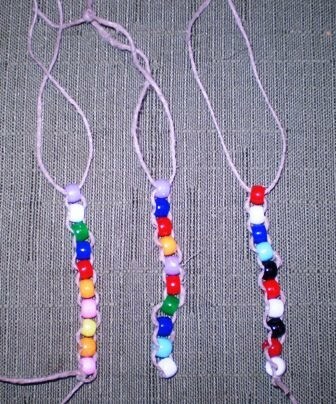 When one of those tasks is completed it is worth one bead for the older two and two beads for Little Sprout. They then slide the bead(s) to the end of the string to mark the completion. The goal for each kid is to get all ten beads moved by the end of the day. When that happens they earn $1 for the day and they are in good standing for privileges. Good standing for privileges means that if we have an impromptu plan to watch a movie, or go get ice cream, or go to the park…as long as the kids are moving beads in the right direction, they have full participation. When the kids know that we are going to have a big privilege like a water park…the expectation is that they will have a certain number of days with ten beads. Any number they fall short of ten is worth five minutes out of the pool. Taking part in any of the “Bead Busting” activities will warrant one warning, and if the behavior doesn’t change, it results in the loss of a bead. This system is working well for a number of reasons for us. Our kids are competitive, (likely the reason they fight so much with each other) so they want to be the first one to get all ten beads moved. Another reason it works is that there is freedom of choice. There is not an assigned chore for each kid, because they can choose which “Bead Worthy” activity they want to do, and if they choose to cooperate to get any of the tasks done, they speed up the process, and they can all earn a bead. There have been some bumps so far, like convincing Big Sprout that handing his sister a napkin at dinner is not a “Bead Worthy” activity, but it is starting to really work. Chores are getting done, fights are curbing faster, and it is a relatively maintenance-free way to hold the kids accountable. I think I should make my own set of beads, and I am going to move one every day for making the good decision to use these beads in the first place! Genius!! This is genius!! I'm going to try it. I'll let you know how it works out. Thank you!!! !